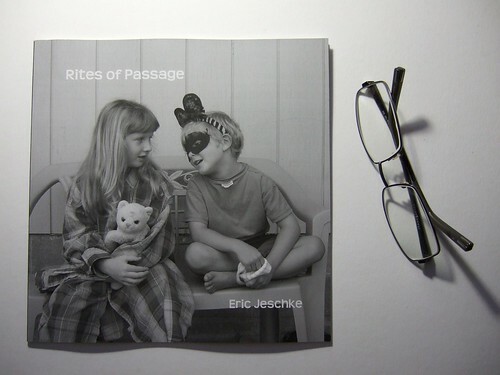 Rites of Passage (softcover, VioVio), originally uploaded by Eric Jeschke. I was surprised and pleased to find a package waiting for me after work today. It was my SoFoMoBo book. More precisely, it was the first of several to arrive. This one was one of two that I ordered from VioVio; the other being a hardback edition. The book arrived very speedily, considering I ordered it only a week or so ago. I certainly was not expecting it this soon. It arrived well packaged. Given what I’d read about VioVio online, my expectations were not overly high. So it was with a combination of eagerness and trepidation that I carefully opened the package and examined the product of my labors. At first glance, it looked pretty good, with a nice glossy finish to the cover, full bleed photos front and back, nicely printed text. Indeed, the text throughout looks excellent, except for a few places where it looks like the printer had just a trace of a smudge going on one of the running headers. The book had the right amount of heft, and the paper looked decent–not too glossy. Now to the images. I have no complaint about highlight clipping or blocked up shadows. I was expecting the sort of usual compression that one sees going from monitor to print, and this wasn’t far off from past experience. Nor do I have any beef with the rendering of B&W tones. Yes, it was clearly missing some subtle tonal transitions that I see in my own inkjet prints of the same images, but overall I was pretty fine with the tonality. There are no obvious color casts–everything seems pretty neutral. At reasonable viewing distances the sharpness seems acceptable as well. All of which leads me to believe that my image and PDF preparation was perfectly fine. Nevertheless, in good light the images seem to have a certain roughness (or is it lack of smoothness?). It it especially evident in larger areas of similar tone. After dinner I sat down and examined the page margins closely and noticed that the paper stock does have a certain amount of speckled discoloration, much like you would see in some matte papers. Putting a loupe to the image revealed the classic halftone pattern that one expects from a printing press. The dots are a lot larger than on an ink jet print, and are pure black and white–there is no color dithering anywhere to be seen. This despite the fact that I had specifically checked the box that said color (their web site saying that anything with images should be printed in color). Overall, my feeling is mixed. On one hand, my $15 book looks pretty good, considering some POD horror stories that I’ve heard about color casts and so forth. On the other hand, my own ink jet prints are so superior to these that these look pretty poor by comparison. Did they make a mistake? Should this have been printed using colored inks? I really don’t have the experience to say, except that I had hoped for better image quality. Of course, my family and friends thought it was great. Am I just being too picky? The hardback was supposed to have a better quality of paper. We’ll see if that makes any difference. Meanwhile, I’m casting my eye around at other POD publishers and keeping tabs on the collective SoFoBoMo publishing feedback. Eric, did you embed a greyscale or colour colour profile? Maybe that was why they switched print method. Or doesn’t VioVio care about colour management? I embedded greyscale TIFFs. I believe the profile was greyscale. I suppose that is why they printed the whole thing in B&W. I’m not so sure that was the right thing for them to do, however. With the large screen (dot) size, it may have yielded better results to print in color. Their web site has a check box that you check if you want color or B&W. I specifically checked “color”, because of their little note on the form saying B&W “wasn’t for images”. I must say that the tones are absolutely neutral. This makes sense, given that only black ink is used. But just like some ink jet printers, sometimes the colors can be used to better achieve a “better” B&W print. I wonder if the real reason for my dissatisfaction, however, is that their printers just do not print with a fine enough resolution. I’ll try to post an image of the dot pattern taken through the loupe. I just got my photo book from Viovio today (I made a 50-page photo book of my wedding and ordered two copies) and was sorely disappointed by the image quality. Many photos have a yellowish/green tint (with my husband’s hair looking green in some photos – and he has brown hair) and some pager were particularly hot when it came to red. Also the resolution leaves a lot to be desired – some images looked polarized, some grainy and some pixilated. I’ve contacted them to find out if anything can be done (especially considering their main products are PHOTO books). Their customer service has been wonderful so far, but I’m worried that I should have spent my money elsewhere for better quality. I really wanted to make my own book from scratch (as opposed to using something like Kodak Gallery, which actually prints in MUCH higher quality), but this was NOT what I was hoping for.